Posted on July 14, 2014, in 5-7-5, Arizona, Haiku Horizons, I Heart Macro, Kofa National Wildlife Refuge, Macro Monday 2, ocotillo, Shine the Divine, Sonoran Desert, Southern Arizona and tagged cruel, driven, flesh, Kofa National Wildlife Refuge, ocotillo, Southern Arizona, taskmasters, tender, thorns. Bookmark the permalink. 23 Comments. Cruel form of torture. This was brilliant and I loved the photo. AMAZING!!! I’ve been impaled by an ocotillo – “driven” is the word! Wonderful macro! Hope you were spared an ouch! Oh my! And I thought my rose bush was bad. 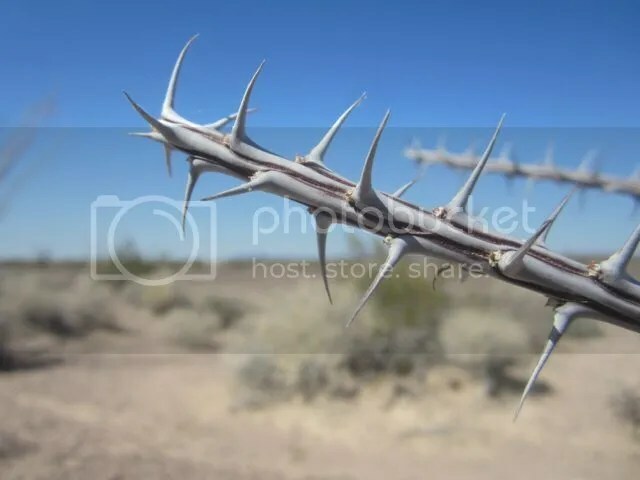 I would not want to meet those thorns. Did you base your haiku on a personal encounter with this plant? A personal encounter from a safe distance! OMG the thorns look scary. Nice haiku. great take ! but why so ….another riddle ,MMT ! Lovely picture..it looks like a weapon. wonderful haiku. Yikes … rather a thorny haiku here … great both photo and its haiku. Those thorns are quite large and intimidating. At least they give fair warning of danger. Ouch, they look really menacing.